The Promaster 2500 is a full size cargo van that offers its best cargo features along with power and performance to make it the best cargo van there is. The Promaster 2500 is the perfect commercial vehicle for any type of business to use with its special features that are applied with its two trim models the 2500 Cargo High Roof 136 WB and the 2500 Cargo High Roof 159WB.Let us take a further look into why the Promaster 2500 is the perfect cargo van for commercial businesses. The Promaster 2500 provides the best power features by offering up to two types of engines under its hood to give it the best performance. The 3.0-liter Ecodiesel I-4 is the perfect engine system that is featured in the cargo van with an I-4 diesel variable geometry turbocharger feature. The engine provides an I-4 cylinder with a MT40 Manual Automatix Six-Speed transmission that provides front-wheel-drive to make it a powerful cargo van. The power of the Promaster 2500 offers 174 horsepower with torque pressure of 295 lb-ft while also providing the best fuel efficiency from its 31-gallon tank of gasoline. The cargo van also brings its best performance to the table with its front wheel drive system that allows the cargo van impressive handling when navigating through crowded city streets, worksites or loading docks. With fewer parts to maintain, the FWD system offers more room for its best in class lowest load floor height. 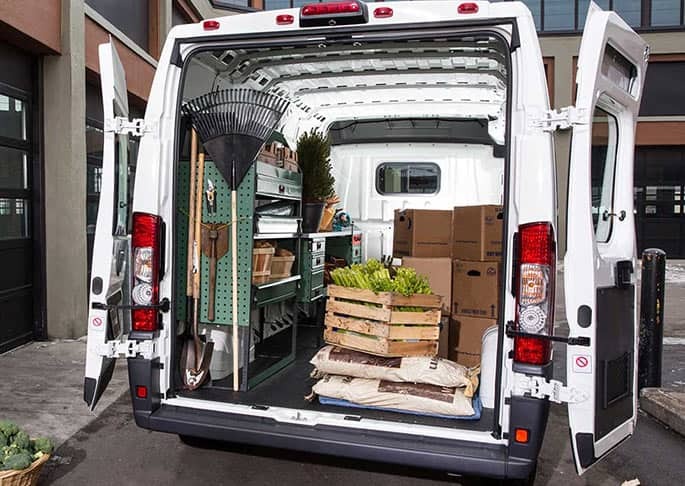 The Promaster 2500's interior design helps commercial businesses with their cargo needs to make it the best cargo van offered. Along with its exterior looks, the cargo van is the vehicle to beat in its commercial class. The exterior comes off the assembly line with a boxed but smooth look, and its easy access features to its interior with a rear door that can swing open to a 260 degree angle and can fold flat against the exterior of the cargo van, which gives the cargo van more space to work with. On the cargo vans side comes 49-inch door openings to help forklifts give easy access to loading the vehicle. The interior provides up to 406 cubic feet of cargo space to provide the best room possible with its easy walk-in feature that allows you to stand tall with its interior height of up to 99.4-inches. The interior also provides two seats and its Uconnect Access System to make it the best van there is. What is the 3 Day/ 100 Mile Vehicle Exchange program? Is East Hills Jeep hiring at this moment? We are open Monday through Friday 9am-9pm, Saturdays from 9am-6pm and Sundays from 11am-5pm. 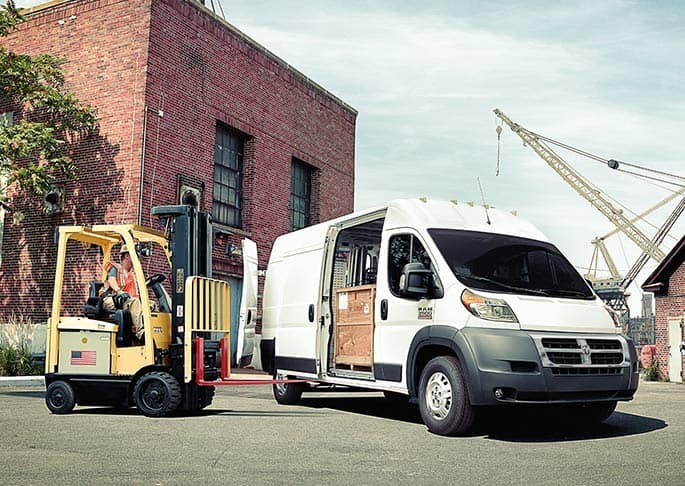 The safety and security of the Promaster 2500 is at the top of its game with up to 35 features. The Promaster 2500 offers standard airbags, with electronic stability control, trailer-sway control, Parkview rear backup camera, Parksense and plenty of other amazing features. 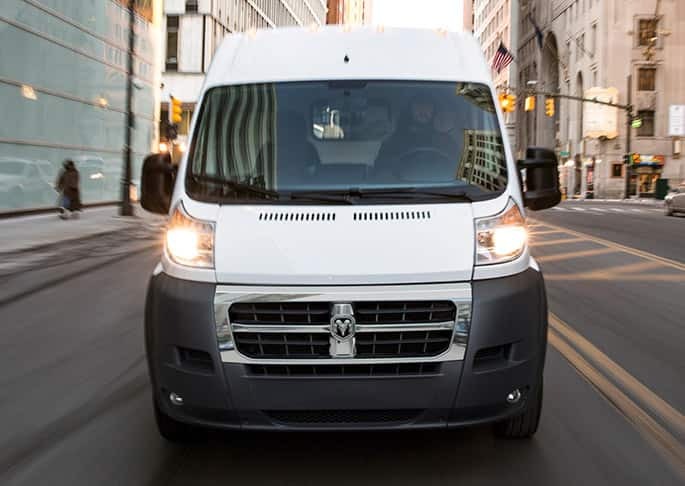 The RAM Promaster 2500 is the perfect commercial cargo van for any type of business when it comes to transportation. If you're business is looking to expand or make a change in the company, then head to our East Hills Jeep Dealership to see what types of deals we can make with your business.